The Correct Posture for Piano Playing! As you know, a good foundation is the basis that the whole structure will be stable. In the case of the piano, this foundation will be the right landing for the piano, because even knowing the whole theory, you banal because of physical difficulties, you can not reveal the full potential. Initially, you may find it uncomfortable to play the proposed method, but believe me, they all came up with it not for the sake of someone’s silly blessing – over time you realize that playing correctly is much simpler than the way it throws itself into the head. It’s all about self-control and nothing more. 2) Hold your elbows: they should not interfere with your game, all the weight of the hand should go to the fingertips. Imagine that you have an air balloon under your arms. 3) Movement of hands should be free, smooth, do not need to allow sharp jerks. Try to imagine that you are supposed to swim under the water. There is another very effective way for people with strong nerves: put on a coin of any merit on the brush of hands: when you play, they should lie on them even if the coin falls – you are too sharply gripped by the hand or the position of the brush is wrong. 4) The fingers should be closer to the black keys. 5) Press the keys with the pads of the fingers. 6) Fingers should not bend. 7) Hold your fingers together, you need them to be assembled. 8) After performing each sound, hang your brush in the air, removing the tension in the hand. 9) Round off all your fingers during the game (as explained to children – put your fingers in the “house”). 10) Use your entire hand, from the shoulder. See how professional pianists play – they lift their arms so hard when they play music, not for the sake of scapegoating. 11) Rely on the tips of your fingers – you need to feel at them all the weight of your own hands. 12) Play smoothly: the brush should not “push” the sounds, they must smoothly move from one to another (the so-called “legato“). Correctly playing the piano, you will notice that the hand feels less tired, and the lessons become much more effective. Playing gamma, sometimes distract your attention from the notes and follow your own movements: if you notice a mistake in the formulation of your hands, or that you sit, bending into three deaths, then correct immediately. In this case, I recommend still asking the knowledgeable people to accompany you in the first stage, but better to help you put your hand – if you immediately start playing wrong and will continue to do it for a long time, then re-education will be much harder, than if all the foundations were laid in its time. 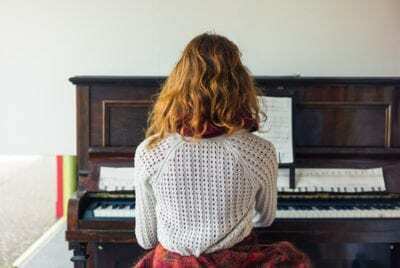 Next Next post: How should an adult beginner start learning piano?